These tutorials are designed to help you become productive in using Cincom Smalltalk as quickly as possible. Over the years, we have produced quite a few tutorials. The vast majority of these are using older versions of our software. However, some of the material may be useful or beneficial in learning the basic fundamentals and concepts of our software. Cincom ObjectStudio Tutorials - In these helpful tutorials, we discuss everything you need to know about getting started with ObjectStudio, as well as using the User Interface. 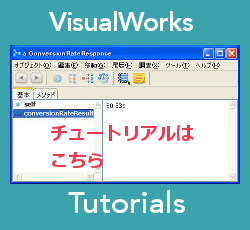 Cincom VisualWorks Tutorials - In these beneficial tutorials, we show the steps in getting started, as well as the scalability, flexibility and usability of VisualWorks.